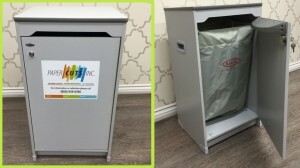 Over the last 15 years Paper Cut's has refined the one of most secure, convenient, cost-effective and environmentally conscious solutions for ensuring the proper disposal of confidential documents. The Paper Cut's process begins with our attentive staff working with you to develop a tailored document shredding program that seamlessly fits your organization. For daily paper flow, our top-of-the-line security consoles are strategically placed throughout your facility at no charge for convenient ongoing maintenance. 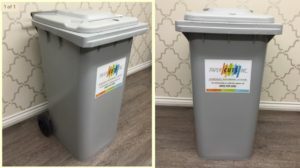 We offer both stationary and portable Security Bins and Secured Containers designed specifically for the collection of confidential materials to be shredded and destroyed. 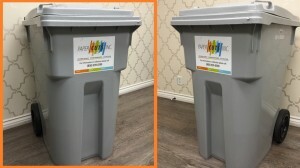 Our Standard Size Bin is our most popular commercial size option and can handle most business needs. 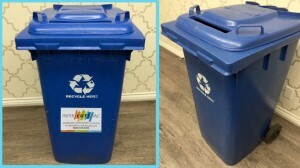 Our 64-Gallon Recycle Bins offer larger capacity and added portability as durable secured container. With a smooth surface and durable construction, this is a long-lasting economical choice for all situations. 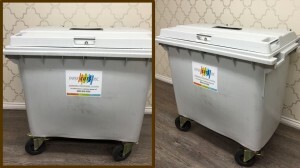 Our 32-gallon Shredding Bin is a reduced-size secured container that offers easy functionality and mobility. Designed for placement in any business office with more limited spacing, it is perfect for a small office, warehouse or home office location. Our 32-gallon Executive Console is a smaller size secured container that offers a more fashionable construction which can fit into any type of style of office furniture or interior design choice. With a smoother external surface, it can fit inside any business office, warehouse facility, or residential location. For larger companies with larger volumes, our XL Container is a perfect choice. It offers greater portability and can hold up to 3 times as many boxes of materials as our other choices. Why Should You Shred? Because it's the Law! There are new Federal and California state laws that require businesses to destroy rather than simply discarding information. These laws have been established in an effort to protect the privacy of patients and consumers while also protecting the business that serve them. Ensuring that your data files and records are shredded and/or stored by only highly reputable, secure document management firm is tantamount to providing peace of mind for the future of your business. Using Paper Cuts is the best way to ensure that your documents are properly destroyed through legally approved processes! Our clients are never charged any type of excessive management fee. Unlike a number of our competitors that charge management fees and do not disclose this to you until after starting their service. And if you need to change a service date? No problem, just let us know in advance and we will make the appropriate adjustment. We will strive to make our services work around your schedule. We always operate in good faith with integrity, honesty and respect, and strive to earn your return business on an ongoing basis. On average, the percentage of small sized companies (100 employees or less) doubled in size from 2008 - 2011. And as organizations have grown in size, the number of data breaches occurrences have increased as well. Paper Cuts is a licensed, bonded and insured company and hires only Professional employees of the highest character and integrity. All Paper Cuts Service Consultants must annually undergo a rigorous training program. Each Consultant receives a criminal background check, is subjected to drug testing, and signs a Client Confidentiality Agreement pledging to protect each customer's sensitive material and maintain total confidentiality. Paper Cuts does NOT charge for any undocumented or additional trip fees, like other competing shredding providers often do. In addition, we do NOT charge additional costs or fees for fuel usage no matter where our clients are located in our service area. We cover the Southern California region as if it is one big neighborhood community, because we work and live here too! 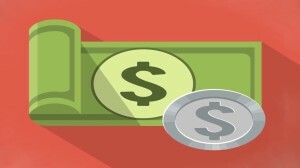 At Paper Cuts, you can expect one, simple and consistent price for the services we provide you.